The new Kia Soul is so compelling you will want to look deeper. And to depict this in the most obvious way possible, Publicis/Toronto came up with "Peer Into a Soul." Each spot tackles the concept with a different film genre, a gimmick meant to appeal to people who want something more from their car marketers. The campaign DP is Robert Yeoman, who worked on The Royal Tenenbaums, Life Aquatic and The Squid and the Whale, so we naturally expected the pieces to ooze some sub-normal slice-of-lifishness -- like that feeling you get when a joke's been told but was so subtle you didn't laugh, and now all the hipsters know you Do Not Belong. The humor here isn't quite that sublime (and for good reason -- they're car ads, after all), but the choice of music definitely oozes Yeoman. To kick off its first season as the NHRA's series title sponsor, Coca-Cola's Full Throttle, with help from Mother New York, has launched a six-spot TV campaign that looks at the sport's history, heroes and that thing that has become known as drag racing. Shot at the Pamona raceway in California by Mother's Linus Karlsson and produced by Greencard Pictures, the spots - in black and white - do the whole Rocky fight prep thing. Except way less Rocky. Each aspect of the sport is highlighted in that...Tom Cruise/Days of Thunder opening credits way. Except...way, way less Days of Thunder. Except...kinda like Days of Thunder...minus the over-blown self-importance of the eighties. Heh. To promote the "extra strong" qualities of Alrin nasal spray, Young & Rubicam/Tel Aviv nailed it with "Umbrella" and "Newspaper" -- two spots that demonstrate what happens when your nasal passages get too liberated too quickly. The human vacuum concept also makes a lot more sense here than it did that one time Justin Timberlake got sucked across town by a Pepsi drinker. - "Twitter for sports." And then our eyes rolled back in our heads, and then we died. 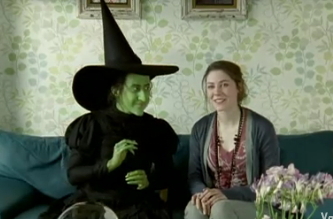 - BFFs with the Wicked Witch of the West. She seems fun. DDR, your house or mine? - The question we all must ask. Sometime. - Shepard Fairey, the guy who did that Obama/Hope poster we all love to wheatpaste on walls that don't belong to us, gets arrested before his first solo art show. Duuuude. Sux. - Scroll down to the part that reads "cb with a Flair." Don't you hate the over-produced, over-styled, ridiculously unrealistic fragrance commercial that insist upon portraying life as if it were based solely upon how you smell? Don't you wish, for once, a Fragrance commercial would do something interesting like...oh...show a cat fight between Natalie Portman and Michelle Williams? Well now your wish, courtesy of Roman Polanski and Francesco Vezzoli, can come true with this spoof commercial for Greed. Now we know where all the good commercials were during the Super Bowl. In France! Yes, in France. Though typical in the sense it's all about boy uses best friend to appear heroic for hot girl he wants to take out, this Pepsi Max commercial just oozes Super Bowl idiocy. Oh and we mean good idiocy in this case. Just one problem. How exactly did that octopus get out of the water so quickly? CLM BBDO created. The name of this commercial, Naughty Boy, and the tagline, "Fresh breath that turns you on," might lead one to believe Colgate has added some sort of aphrodisiac to its toothpaste. But upon viewing the spot, one wonders if what Colgate, instead, added was some kind of seizure-inducing ingredient. Otherwise, this dude's expression of getting "turned on" is seriously warped. Rediffusion Y&R Mumbai created the spot. There isn't much that skeeves a guy out more than alluding to testicular injury and that's the nut this PSA from the Government of Ontario cracks. Calling attention to the apparent return of Mumps, the PSA highlights the isolation required when Mumps is detected and some of the weighty symptoms that con come with the disease. HR Block Does Oddvertising Thing. Because really, three cyclopses and a wheelbarrow of cash should be all it takes to convince you H&R Block is the tax refund brand of choice.